Idle killer is an idle clicker browser game in the vein of Cookie Clicker, except you won’t be baking cookies for your magical grandmother. It takes place in a very dark world, inspired by brutal civil conflicts around the globe that make for shocking newspaper headlines. 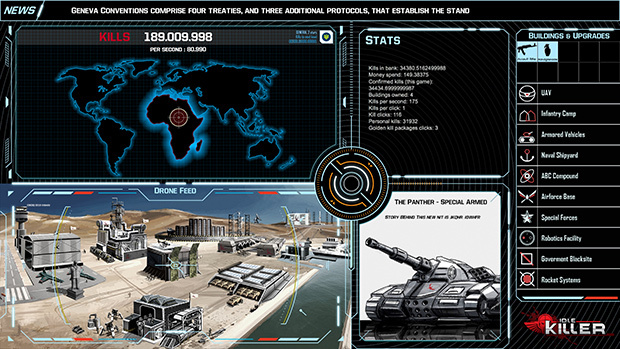 The player controls the character of a former child-solider named Boatema, as she torturously rises to power in the war-torn fictional African country of Zamunda. No word yet whether or not Eddie Murphy makes an appearance. When I first saw the intro movie for the game I got goosebumps, Boetema is not your typical female protagonist, at age 4 her mother died of HIV, at age 7 local militiamen burned down her village, at age 8 her remaining family was killed, at age 10 she was forcefully conscripted as a child solider, at age 13 she was raped and tortured by government forces , and at age 17, according to the intro video, Boetema is “enraged and determined to take control.” Given the gruesome backstory and subject matter of Idle Killer it’s easy to understand the Danish development teams decision to make the game browser based. They claim they are doing this to avoid PEGI/PG ratings, but I suspect they know they would have a very difficult time getting something like this on mainstream app stores. As such this a free browser game. Gameplay wise Idle Killer is an idle click game fused with visual novel and RTS elements. The currency of trade is kills, the more you click the more you kill. Killing is done by clicking and releasing bonus kills. Buying military buildings and upgrades will also aid in increasing the kill capacity. All this is presented in comic book style illustrations. The Indiegogo project has a $9,000 goal, which according to the team will be used to take the game from an alpha build to a presentable beta, they intend to use the funding to upgrade the game to allow multiplayer as well as enhancing and polishing the artwork and audio. Idle Killer is a fixed funding project, so the developers have to get the minimum of $9,000 by deadline in order to receive any funds.